MIAMI — The drilling of a $1 billion tunnel connecting the Port of Miami with nearby expressways is finished, but it won’t open to traffic for another year. A $45 million drill nicknamed “Harriet” began its underground journey on Watson Island off downtown Miami in November 2011. It reached the port July 31. Then it was disassembled, turned around and reassembled for a return trip heading back to downtown. That return trip began Oct. 29. The excavation came to an end Monday morning on Watson Island. Hundreds of workers will now begin laying pavement for roads inside the tunnel. The project will give cargo trucks a direct route to the port from nearby expressways such as Interstate 95. Currently, port-bound traffic has to travel through congested downtown streets. The tunnel is scheduled to open to traffic in May 2014. Chris Hodgkins, vice president of Miami Access Tunnel, the multinational company that is building the tunnel, said the drill will be disassembled again and recycled for future projects. “Whatever can be saved will be saved, the electric motors, the hydraulics,” he added. The tunnel is one three major transportation projects in the works in South Florida. The others are a $1.8 billion reconstruction of Interstate 595 in Broward County and a $2 billion transportation hub near Miami International Airport. June 12, 1996 – Public Hearing. 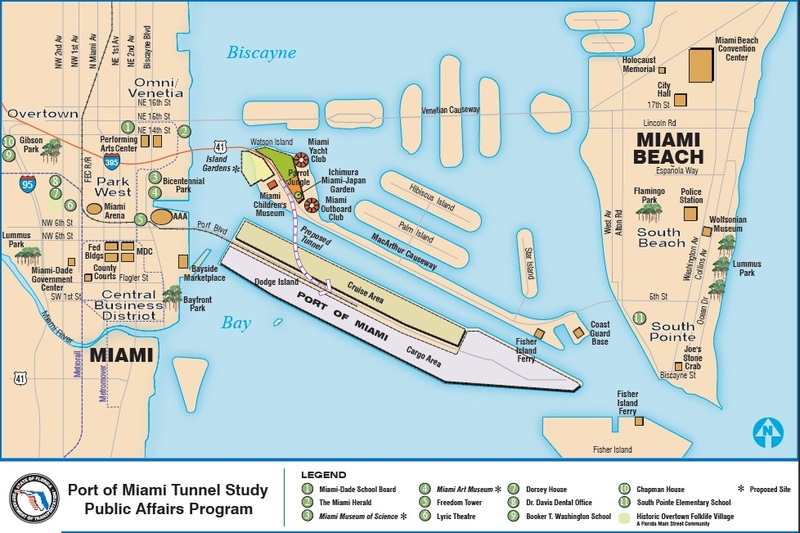 July 12, 1990 – FDOT and FHWA determine the preferred alternative is a tunnel crossing diagonally under Main Channel and connecting to MacArthur Causeway on Watson Island. 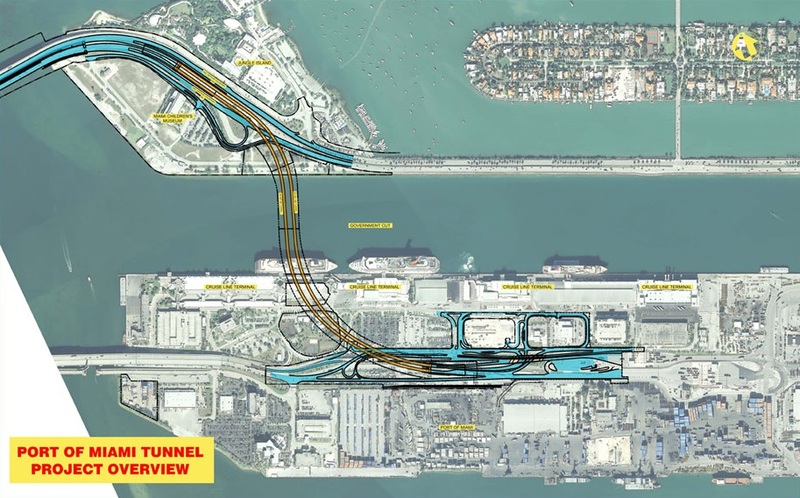 The concrete for the tunnel will allow some 16,000 daily trucks to bypass local streets and directly access PortMiami from Interstate 395 and I-95, is expected to last 150 years. It is the first tunnel in the U.S. with a passive fire protection system: concrete panels specially treated for fireproofing, says Trevor Jackson, chief executive officer with MAT Concessionaire LLC.